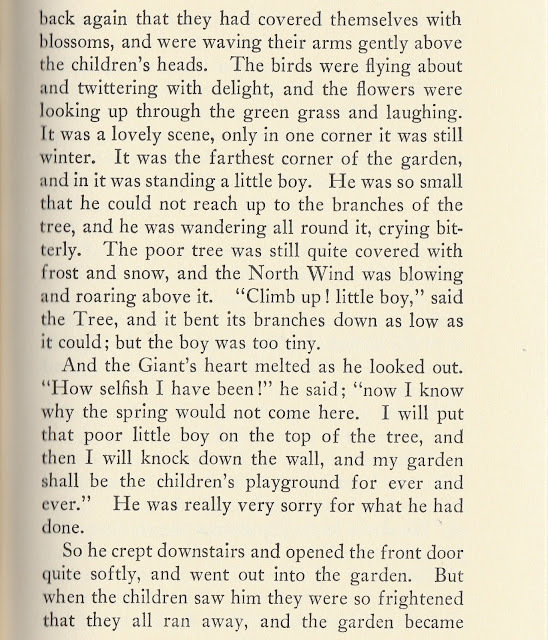 from Story Hour Readings - Fifth Year by E.C. Hartwell, Anonymous Artist? 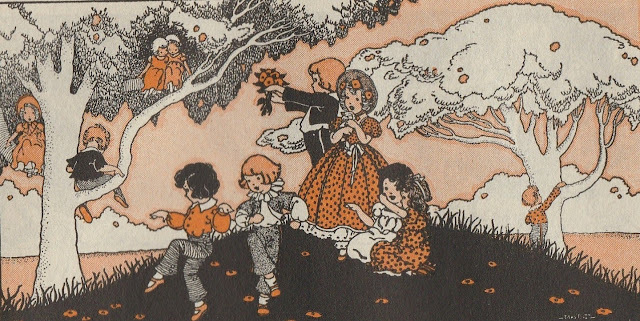 from the My Book House set edited by Olive Beupre Miller, Anonymous Artist? Enlarging the picture finds the artist may be "Martin"
That's the story as Wilde wrote it. 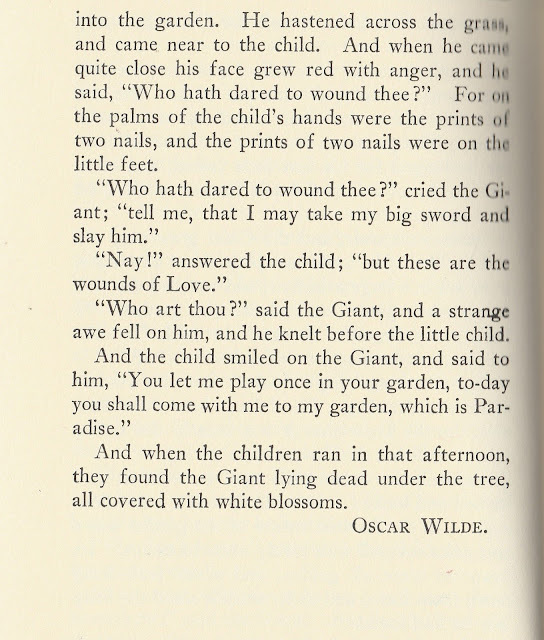 I find it interesting that My Book House ended the story without the revelation of who the "little boy" was and the eventual death of the giant. 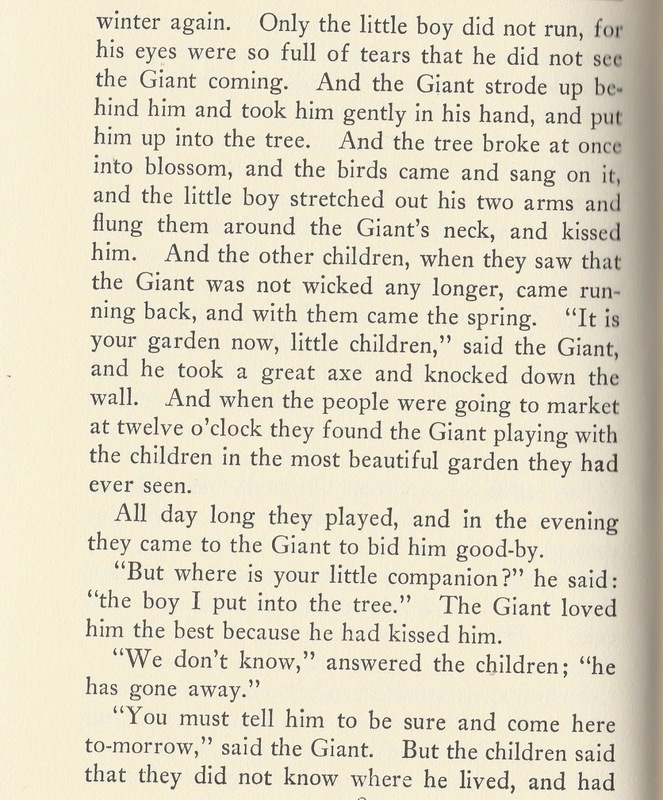 Their story ends two and a half pages earlier, ending with "And when the people were going to market at twelve o'clock, the found the Giant playing with the children in the most beautiful garden they had ever seen." This picture (with a clue to the anonymous artist) accompanies that ending. 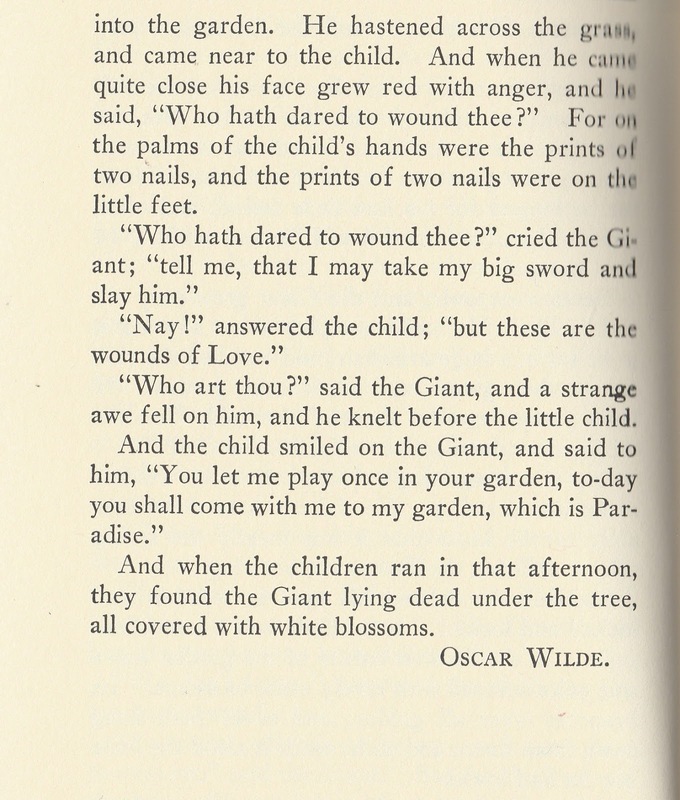 I'm positive Wilde would hate that sanitized ending as it clearly eliminated the very purpose of his writing. It wasn't just about being selfish. This leaves me feeling rather like the giant knocking down the wall. 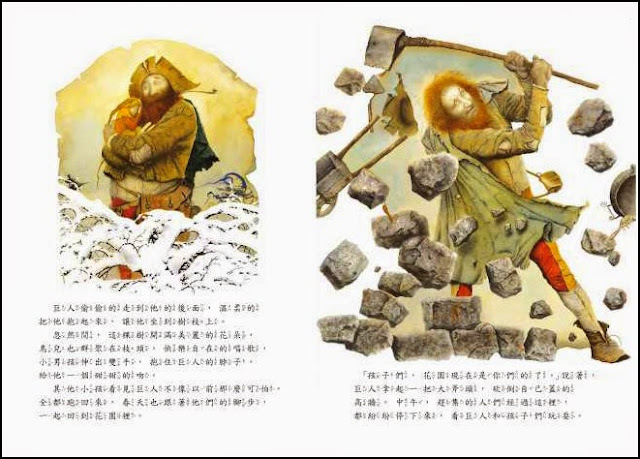 It's interesting other anthology illustrators, with less opportunity to illustrate scenes than a picture book illustrator, don't show the giant's action changing everything. In their defense, they may have been told what pictures were wanted. 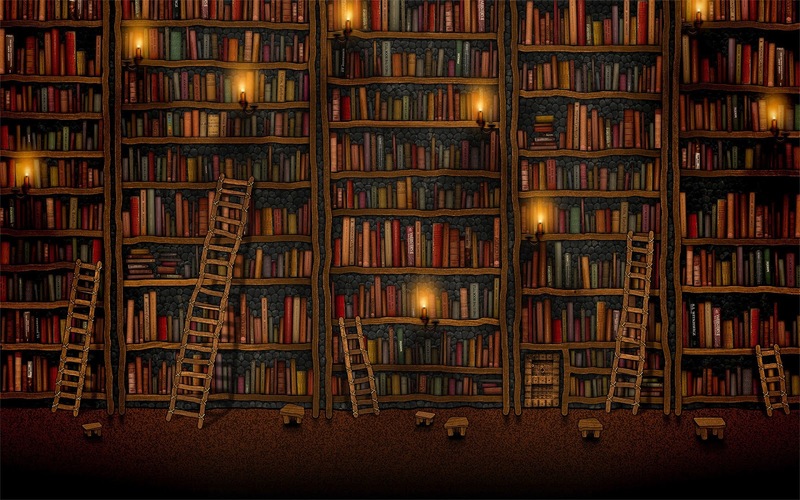 Picture books of the story are a modern opportunity to look at the story. Last week I dared to give one illustration from Once Upon a Blog's posting of the Belarusian picture book version by Wladimir Dowgialo. This downloaded two-page spread sums up my reaction to changing this story. 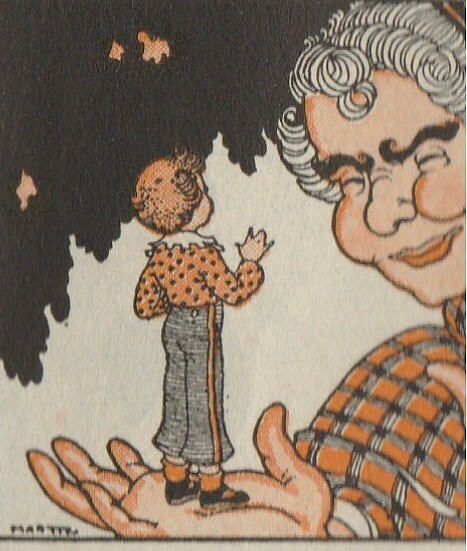 The Selfish Giant is an old favorite story for me, but this time I found myself realizing I had seen it in my own life. 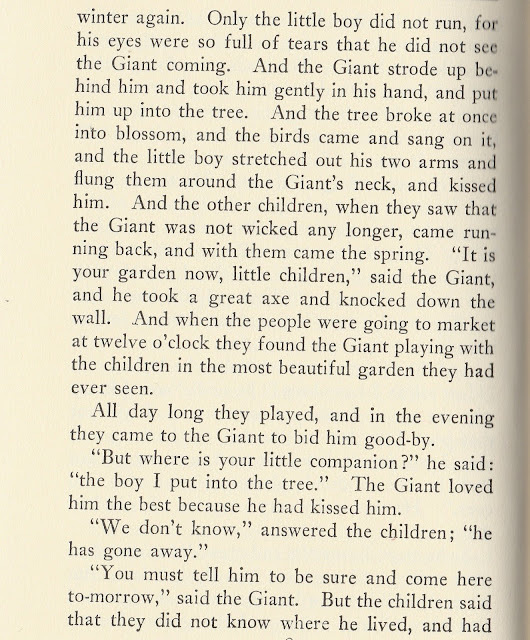 The giant chased the children away from his property. My own mother would see the neighborhood children playing in the street in front of our home, including the street light and our driveway and chase them off. As a child I always wondered why she did this and what harm she thought it caused? 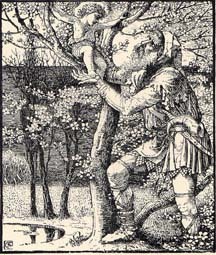 It's worth the audience of the Selfish Giant thinking -- without using the judgemental label of "selfish" -- if they have ever seen anybody react like the giant or if they had ever reacted similarly. Why? It's also worth thinking if any incidents in history might have been a similar action. What was the result? How might it have gone differently? 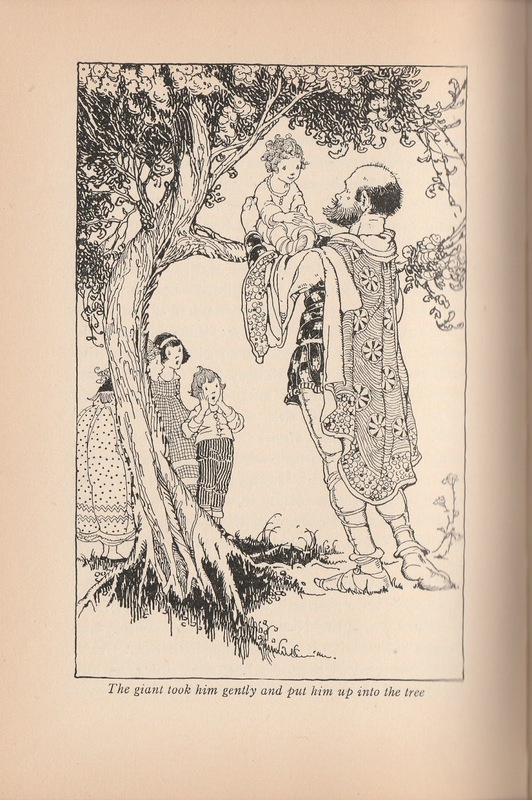 Last week I included this comment: As "Gypsy Thornton or InkGypsy" put it when writing about The Selfish Giant in her Once Upon a Blog: This story seems to be one of those 'illustrators's dream' assignments as I've rarely seen a sub-par set of illustrations for this fairy tale. And how could it not be? 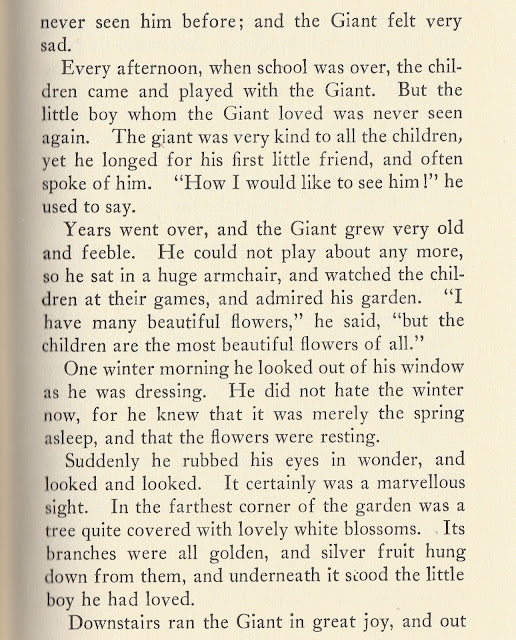 Giants, children, seasons, castles, trees, a little visit from a not-quite-human visitor and a village populated with interesting characters.. there's so much to work with. What illustrations might an audience provide? Music? Dance? 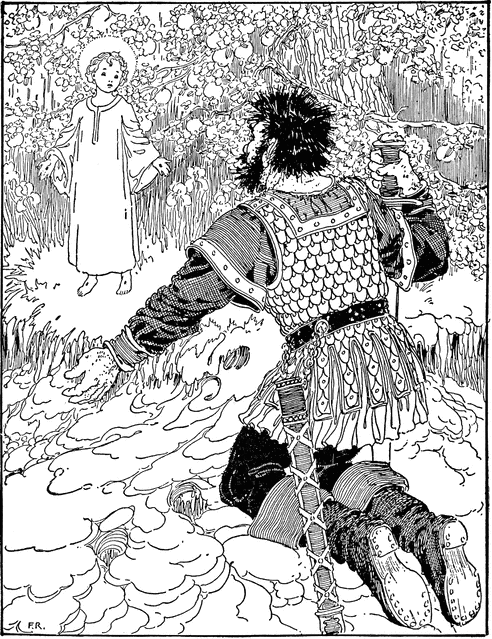 It would, of course, be worthwhile seeing the many illustrated books of this story. 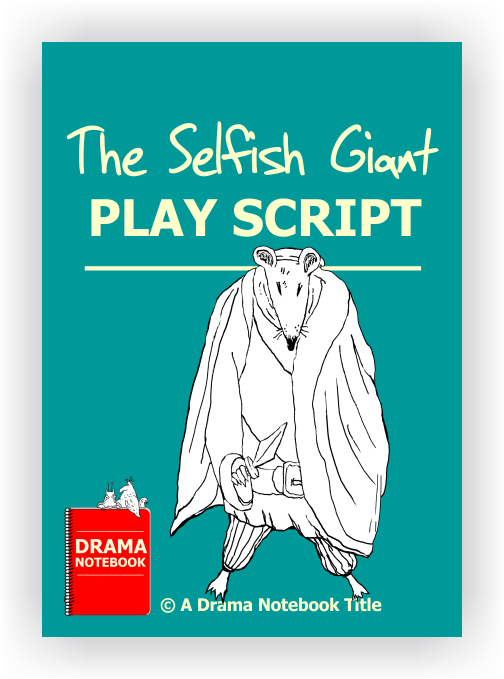 Here's another book worth checking, a 10 minute play script and it's one of many dramatized versions. Maybe you have wondered about this classic story and what age may enjoy it. Many have used this story in teaching. One of my illustration sources, Story Hour Readings Fifth Year by E.C. Hartwell, dates back to 1921 -- when reading levels were different, but there is no true answer as to what age can handle the story. 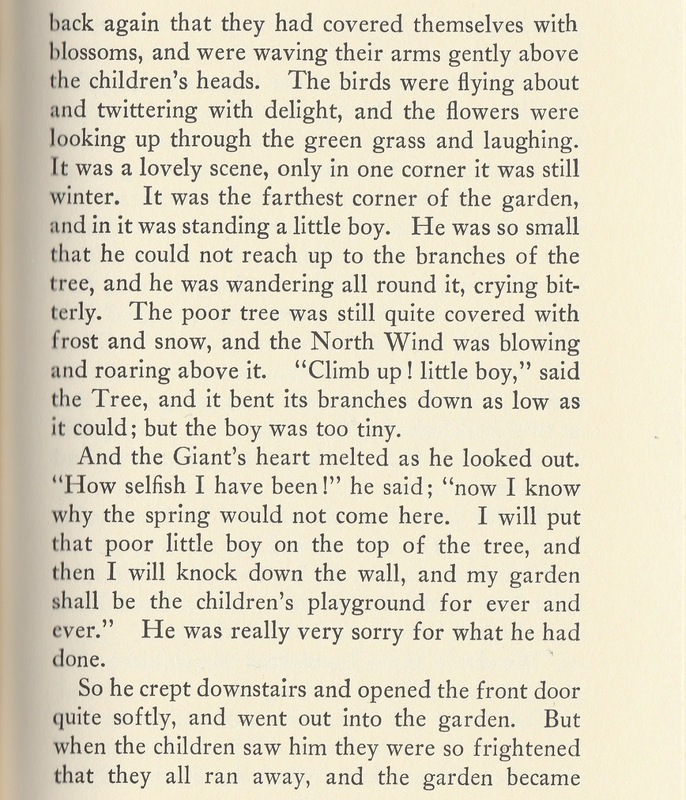 It's interesting that edHelper lists their activities are for high school and Wilde, himself said the story was to be read (I'd add "or told") to children because he didn't simplify it. It works well with adults, too, and is even recommended in Around the World in English, (which opens with a video, followed by comprehension questions, vocabulary, and a quiz on the many irregular past forms used in the story), the blog for students and teachers of English as a foreign language. 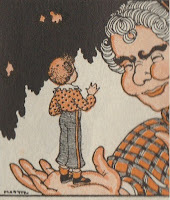 I even found a reference to The Selfish Giant story in Hindi. Redefining English Classroom gets creative in what it asks students, but most like ExcellUp use "closed" questions, as does Fun Trivia, EduRev, there's even a YouTube video of "important questions and answers", also Proprofs quizmaker uses 29 fill-in-the-blanks to take the provided verbs and have the student use it for practice in "irregular past forms." 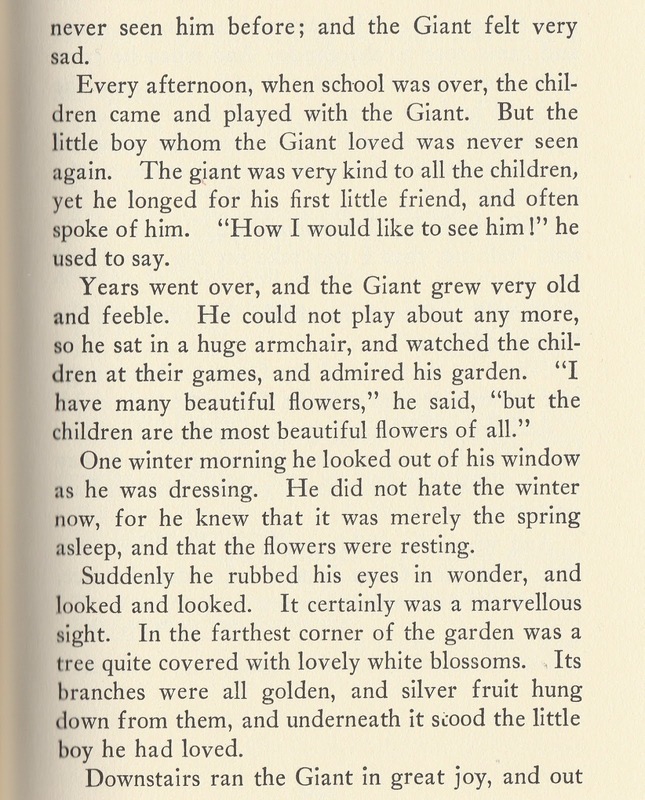 There are also several teacher's guide and workbook pdfs (also http://mptbc.nic.in/books/class11/enggt11/ch5.pdf; and http://www.imaginative-inquiry.co.uk/wp-content/uploads/2012/11/The-Selfish-Giant.pdf are a few more, but there are certainly others.) Teachers with a paid subscription to edHelper.com can obtain activities, worksheets, and lesson plans, with similar ideas from the British subscription company PrimaryLeap. 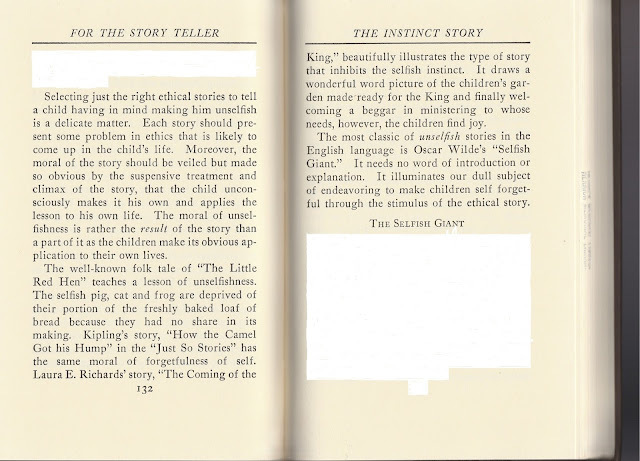 Personally I prefer letting any story stand on its own without analysis of "meaning", but this is clearly a story useful for "character education" or teaching values. At the risk of what I call "tearing the wings off butterflies", here are two of what I am sure are many resources for that type of evaluation: eNotes.com and Uisio.com. The story has clearly captured the interest of many. There are a variety of filmed versions, especially animated movies. I'll leave you to hunt for those (instead of Easter eggs?) as that goes beyond my storytelling mission. Yes, yes, I know the term "storyteller" and "storytelling" gets used by the movie industry, too, but for the sake of this blog and my own focus I prefer to restrict storytelling to oral telling, but allowing for it often originating in print. Here's my closing for days when I have a story in Keeping the Public in Public Domain.